Tired of expense reports? 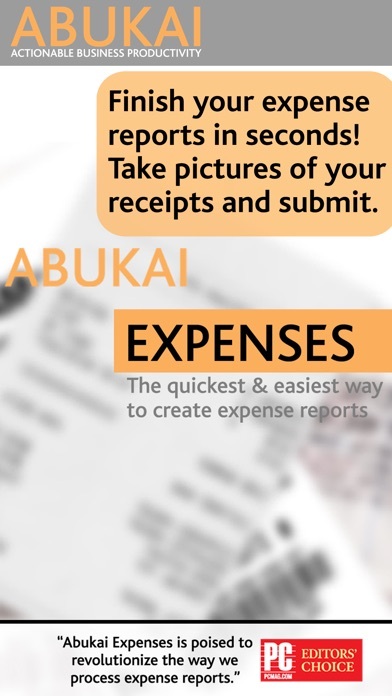 Finish your expenses in seconds with ABUKAI! Step 1. 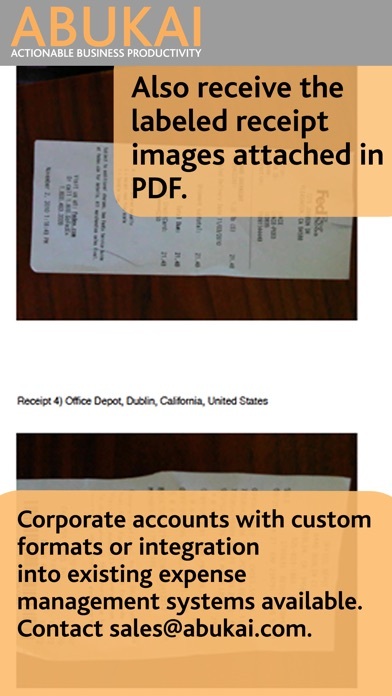 Simply take a picture of each receipt while on the road or in the office. Step 2. Hit “Process Expense Report” anytime you are ready. 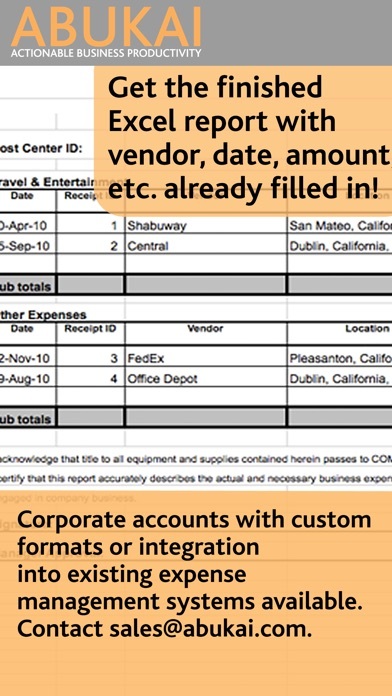 You will receive your finished expense report with cost categorization, date, vendor and all the other information already filled in for you. Named one of the six Best Mobile Small Business Apps by Staples. Named one of the Top 5 Apps for Investing and Finance by Nasdaq. Named one of the Top 20 Cloud Services for Small Businesses by PC Magazine. PC Magazine Editors Choice: "ABUKAI Expenses is a knock-your-socks off mobile app... ABUKAI is right there at the top of the list. I was blown away by the accuracy... It's an obvious Editors Choice for business users. ABUKAI Expenses is poised to revolutionize the way we process expense reports." AGuys: "An application and a service that I have been wishing for ever since I was able to spend money... You answered my prayer…Your app and service are amazing!" ABUKAI's receipt scanner eliminates all the cumbersome work associated with creating expense reports and business expenses including typing data from receipts, categorizing expenses and looking up exchange rates. 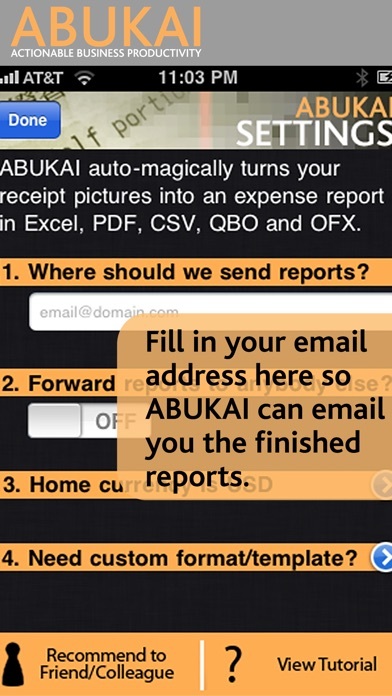 ABUKAI will "automagically” create your expense report and email it to you once you submit your receipts. 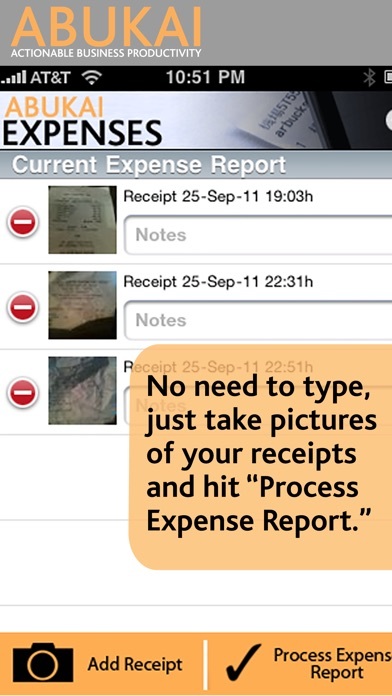 Downloading the ABUKAI Expenses mobile scanner application is completely free, and includes 12 expense reports/year (counted as sets of 10 receipts). Additional expense report submissions or customization require subscription to an ABUKAI Expenses account plan. Do you require customizations or have a different expense report template? With the standard version available for download, you will receive expense reports via email in Excel and PDF. ABUKAI can tailor reports to your company’s existing Excel format or directly post your expenses into your company's expense web portal, document management system or ERP system. For example, ABUKAI can directly post your expenses into tools such as Exact, FreshBooks, Intacct, MYOB, QuickBooks, Sage, or Xero Accounting. ABUKAI can also be customized to upload expenses into Oracle or SAP. Please email us at support@abukai.com with your feedback. I wish I didn’t just send pictures for my expense report and that it made it easier to access the receipts after you filed for the report. But I like the idea. Just needs some work. App for only very simple paper receipts! The premise of the app is great in terms of just take a picture and it will create the expense report. However, it cannot handle multiple pages together - breaks them into separate receipts. Neither does it maintain the order in which pictures are taken. They are all jumbled up even when taking them and not just in the final report. Also does not import the picture from IPhone or other electronic options. Have to position over a screen to take one. For simple expenses, it is able to get the final bill amount but for others need a lot of modification in the final excel report. Overall, good to only take pics of simple receipts on the move but does not solve the whole purpose. As a Tour Director for NPR Tours.com, I spend a lot of time on the road and in the air. Abukai is the only app on the market which automatically scans my receipts (even uploads photo’d receipts), calculates all the math, and outputs into Excel or a variety of other formats, absolutely automatically. Best of all, not just in US dollars, but in Euros or virtually any other currency - particularly handy when traveling abroad. Just carry a Ziploc and stuff it with your receipts, then have Abukai do the rest! For those that travel extensively, ABUKAI is a life saver. Makes preparing expense reports a thing of the past. Best app I have ever used! This is one of the best apps I've used, free or paid. I just take a picture everytime and at the end it generates such a comprehensive details, including currency conversion. Might be fine for the casual traveler with simple expenses, but more complicated with splitting amounts or combining receipts doesn’t cut it. I have to look over every single number anyways. Easier for me to do it all manually. Awesome Expense Program works great with IPhone.